Salt Lake City is one of the greatest hiking destination in America. Name any other city in the country where within 300 yards of the downtown center you can be walking in a protected nature reserve while spotting elk and raptors. And where else can you have easy access to five federally designated wilderness areas—some within easy walking distance of residential neighborhoods? With mountains on every side, Salt Lake City offers a greater variety of dramatic and awe-inspiring hikes than any other major city in the U.S. And just beyond the metropolitan area, SLC is essentially surrounded by thousands of square miles of national forests, with unprecedented access to eight spectacular national parks that can be reached on less than a tank of gas. But, as always, Salt Lake City can be a matter of "so many hikes and so little time." So, if you only have a few hours for a morning hike or afternoon outing, here are five great treks in the area that you simply should not miss. Where: Uinta Mountains, 40 miles east of Salt Lake City Length: 4.1-mile loop Duration: 3 to 4 hours. With a trailhead at 10,154 feet, you’re already in the midst of the mountain scenery upon arrival to Lofty Lake Loop. Once on this hiking path you’ll encounter lakes, streams, mountain passes, deep woods, sprawling meadows, and stunning views, all without ever dropping below 10,000 feet in elevation. There are a few steep ascents and descents along some rocky sections of trail, but the scenery is so rewarding that it’s easy to overlook the challenges. Even at these high elevations (some even above treeline) wildflowers abound and wildlife can often be encountered. The trail is easy to find and follow, although it’s not as well marked as we'd like. Be sure to pick up a free map at the Kamas Forest Service Office on the way to the trailhead, it will help you navigate your way around. Lake Mary, Lake Martha, and Lake Catherine, known collectively as Brighton Lakes, lie at the top of Big Cottonwood Canyon just above the Brighton Ski Resort. They form a chain of pristine, glacially fed, alpine lakes set in granite bowls and surrounded by woods of fir and spruce. Since Lake Mary is closest to the trailhead, and can be done as a 2.2 mile round trip hike, it’s the most popular destination for families and day hikers looking for a quick taste of the trail. It’s also a great spot for a picnic or a summer afternoon of lakeside recreation too. Continuing on to Lake Martha and Lake Catherine takes a bit more time, but as a result the crowds thin out nicely too. Outside of an occasional angler, you may be the only person on the trail as it climbs upward toward the treeline, bringing a nice sense of peace and solitude along with it. Where: Mt. Timpanogos Cave National Monument, in American Fork Canyon, 25 miles south of Salt Lake City Length: 3 miles round trip Duration: 2 to 3½ hours, including 1 hour for the cave tour. Even if there wasn't a spectacular cave at the far end, the hike on this fantastic trail, which cuts through the American Fork Canyon, is memorable in its own right. You’ll climb 1,000 vertical feet up the canyon wall, and pass through sub-alpine forests of fir and pine, before ever arriving at the cave. The fact that the trail is paved doesn’t detract one bit from the pristine beauty of the canyon setting either, which includes rocky cliffs that tower overhead. Plus, you’ll probably appreciate the surefooted surface as you pass a number of unprotected drop-offs along the way. Allow an hour for the ranger-guided cave tour, and buy your tickets in advance at the visitor center. Remember, the cave remains a constant 45 degrees Fahrenheit, so even on a sweltering summer day, bring a sweater or jacket for your time below ground. 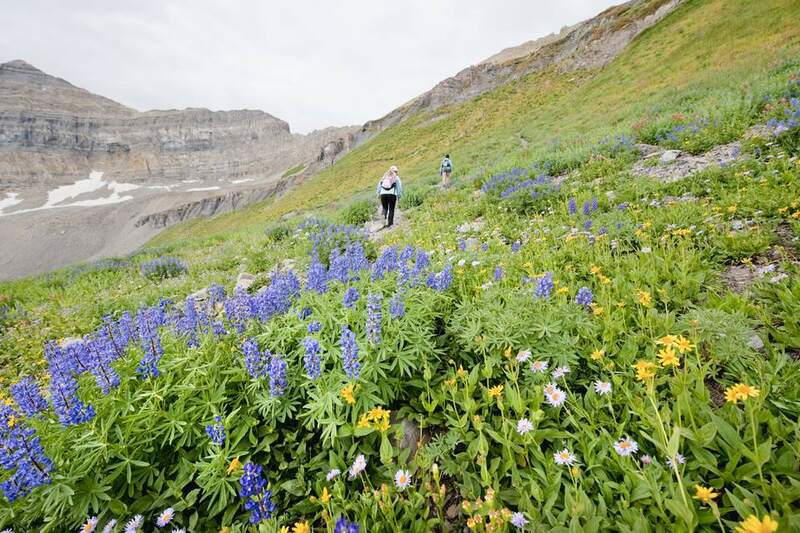 Where: Mount Timpanogos Wilderness Area, accessed from the Alpine Loop (UT 92), 35 miles southeast of Salt Lake City Length: 14.8 miles round trip Duration: 6 to 11 hours. The Timpanogos Massif dominates the eastern skyline of Utah County to the south of Salt Lake City. The climb to the 11,749-foot summit is a worthy challenge, and one that reasonably fit hikers should be able to achieve. On a summer Saturday you’ll be joined by hundreds of other trekkers on the trail as you ascend the Giant Staircase, which is made up of a series of five canyon benches, before arriving at the upper glacial bowl. Then it’s still another hour or more along a knife-edge ridge trail to the rocky summit itself. The waterfalls, wildflowers, and wildlife (mountain goats are almost always sighted) are as exciting as the commanding views from the top. Be sure to pack plenty of food and water, as this can be a long day on the trail. Doughnut Falls is well-known by local hikers, but rarely seen by visitors to SLC. It’s an intriguing sight — a unique waterfall that plunges through a hole in the rock and into a grotto before cascading down the rock drainage below. It’s a short hike that even small children can complete, but keep a close eye on them, as they're likely tol be tempted to climb in and around the waterfall, which can be dangerous. It’s easy to spend an hour or more playing around the falls. The trail and falls are set in a forest of spruce and aspen, which is populated by ground squirrels and chipmunks along the trail, but deer, moose, and beaver can often be spotted as well. I am a hiking guide in Switzerland every summer. Visit my 5 Best Day Hikes in the Swiss Alps for some of my favorite walking routes in Switzerland. If you'd like a hike that is off the normal Jungfrau tourist trails visit hiking a quieter route.